$475,000 in Annual Billing in 15 Months – WOW! I informed Bob that his growth for the 15 month time frame indicated, was a new NCI record. That much of the credit goes to him and his client service rep, Bob Walden, for doing such a great job with our program. Bob indicated one of the reasons he felt his success was so remarkable was his willingness to stay involved and meet with his salesperson and telemarketers weekly. When asked about plans for the future, Bob indicated his original goal, when he first started talking to us, of a $5,000,000 practice has changed. “I came from fast growth environments and I wanted to dream big. Five million dollars is definitely possible if I want to take on partners, and I probably won’t. There is a lot to be said for completely doing your own thing. I see us now growing to about $1,000,000 to $1,200,000 and should be there in another year or two.” Bob indicated another helpful aspect in his marketing campaign is providing incorporation services. He got the idea from Norma Fletcher, NCI Senior Account Rep who hired and trained his sales rep and telemarketers. Bob indicated they are doing two to three incorporations per month and that helps with his cash flow as well as providing another value added service to his clients. Bob also indicated that after 15 months in practice he receives two to three referrals every month, a testament to the outstanding service he provides. 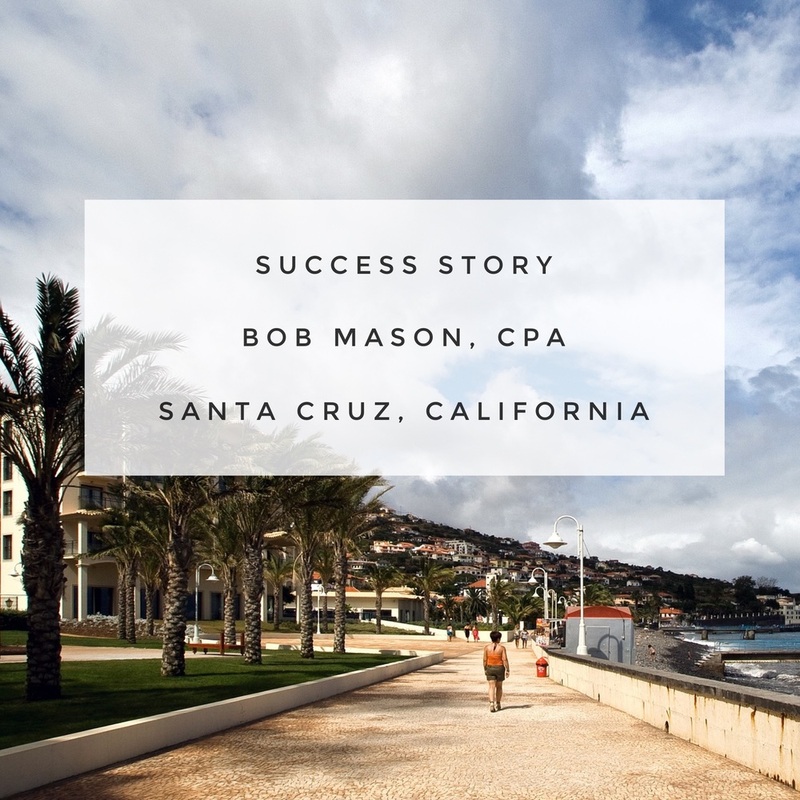 You can contact Bob Mason, CPA at (831) 462-0330.